In many ways quality and marbling overlap each other, since it usually follows that highly marbled beef is also high quality beef. But lets break it down here one at a time. I like to think of this as the quantity component, as opposed to quality. 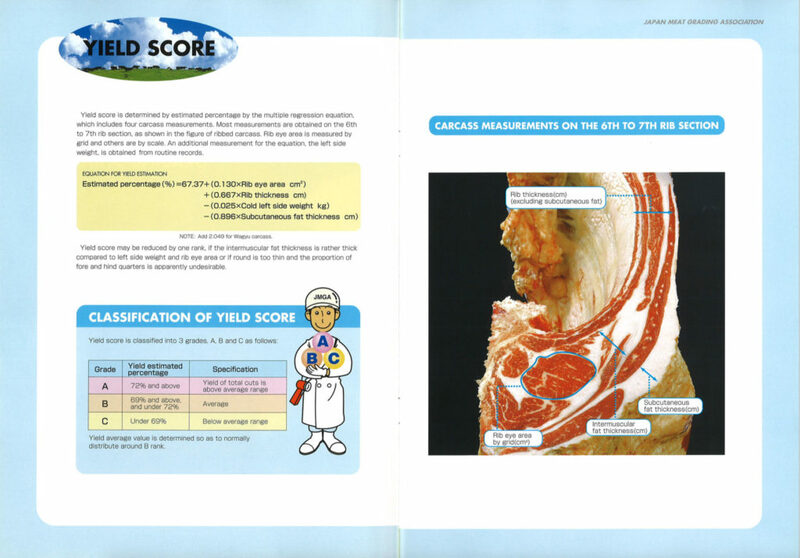 A yield rating is a percentage figure that objectively describes the cutability of an animal, or the amount of the animal that can be harvested from a particular area of the carcass. 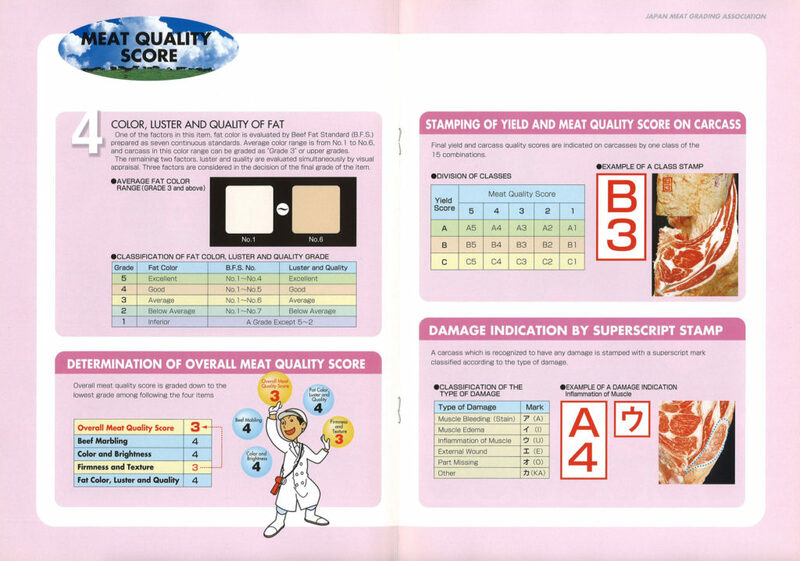 The four measurements are: rib eye area; rib thickness; cold left side weight; and subcutaneous fat thickness. 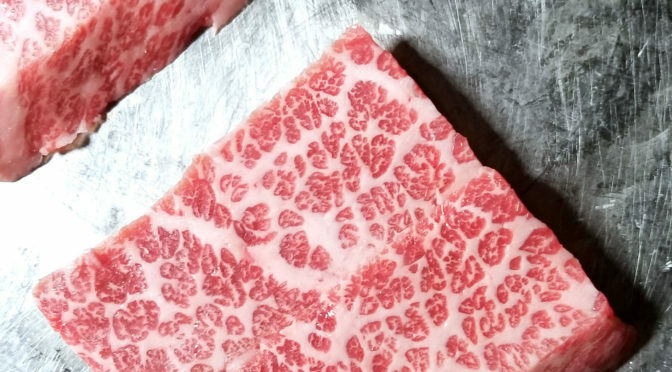 Raters score wagyu as either A, B or C in Japan. A has the highest yield, at 72% or more. B is 69-71%, and this is the most common yield. C is under 69%. From a business and sales standpoint, it’s better to have higher yields on your animal. So A is better than C in many ways on that angle. For example, a carcass can get knocked down from A to B if the band of outer fat (not the marbling) is too thick, because it lowers the cutability yield (makes the actual rib eye meat smaller). Farmers and ranchers who raise the animals will want to select and breed for good yield traits. From a consumer’s or diner’s standpoint, however, the yield isn’t, or shouldn’t really be, much of a concern. While a rating of A, B or C makes us instinctively think A is better than C, that would kinda be wrong in this case. 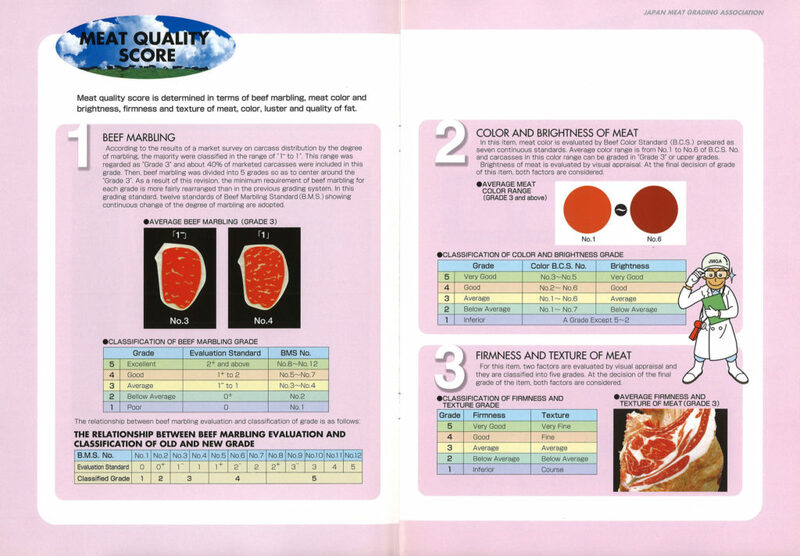 Quality grades describe the meat’s marbling, color, brightness, firmness and texture. It also describes fat quality, color and luster. This score is assigned as a value of 1 to 5, with 1 being the lowest quality and 5 being the highest. A lot of detailed analysis goes into this score. 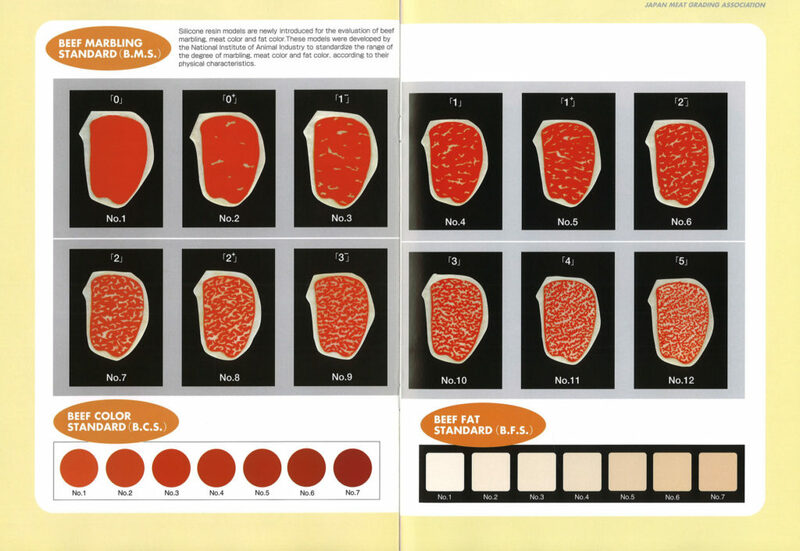 As you can see, marbling, meat color and brightness, meat firmness and texture, and fat quality, color and luster are all evaluated on separate scales before being plugged into the overall quality score of 1-5. Pretty intense. Some of the measurements are now starting to be done with cameras and digital image analysis software (like in the US), to more objectively determine the quality scores. You may be thinking, why the redundancy? Well, as I mentioned in the previous section, the quality also takes meat color, fat color, texture and other variables into account. 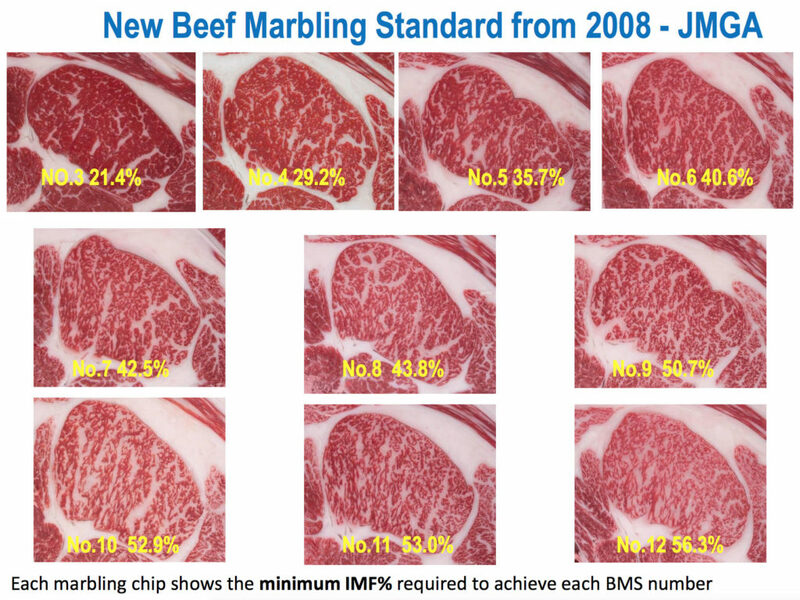 BMS, again, is purely about the marbling. But when I see “A5” on a menu, I want to know the BMS as well. 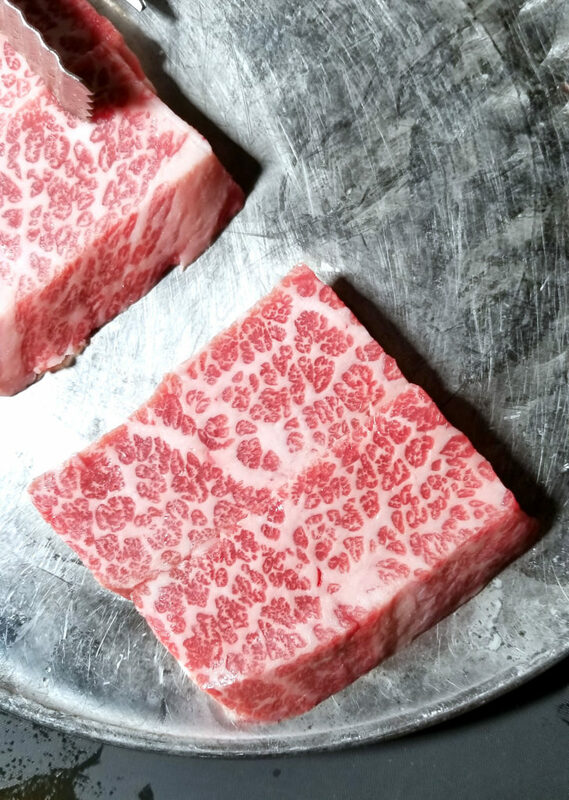 I sell BMS 9 domestic wagyu strip for $75 a pound, whereas I sell BMS 12 Kobe for $200 a pound. Both would be considered a quality of 5. See how the BMS score just within the quality rating of 5 can drastically alter the price? Crazy. Basically the best quality available is A5 BMS 12. The A means that there was very little junk on the animal, and it had a good-sized rib eye. The 5 means it’s the best when assessing all the variables relevant to quality, like color, texture and fat. And the 12 means that it has the most marbling. But I wouldn’t shy away from B5 or C5 BMS 12 either. Remember the letter grade is more about quantity, at least it seems so to me, anyway. Actually, my sweet spot seems to be around BMS 8 or 9. Anything more than that is like foie gras. It tastes like a completely different protein.